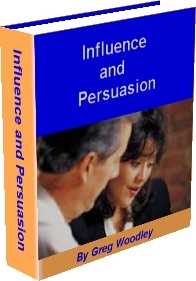 If you are interested in making more sales, then "Influence and Persuasion" is going to be very important to your future sales success. These other sales people are just more influential than you, more persuasive. And what is really funny is these other salespeople that are making all the sales probably don't realize exactly what they're doing. I know I didn't for many years, I just made sales. These sales people just learned by trial and error over the years OR they were lucky enough to stumble on some effective methods of influence.. But I'm here to tell you that influence and persuasion can be learned and learned quickly too. Imagine being in a meeting with a prospect and knowing exactly how to formulate you offer to be appealing to them. And knowing how to speak to them in words that are music to their ears. How much will that increase the likelihood of them buying from you? Then I became very interested in these different mind sets. I studied it. I searched out books that wrote about the different ways buyers think. I listened to expert salespeople. I spoke to successful salespeople whenever I could to uncover how they understood their prospects and used that to get them to buy. After about 18 years of investigating and practicing influence and persuasion, maybe I'm qualified to offer suggestions on how to influence people to buy more from you? How to see the world through their eyes. What phrases will get to them and motivate them to examine your offer. How to understand what's most important to them, what they are going after. How to structure your offer to improve your chances of their compliance. How to structure your offer to avoid them procrastinating. How Important is Influence and Persuasion in Sales? "The influential man is the successful man, whether he be rich or poor." Do you really doubt that it takes influence to get people to part with their money? I mean what's it worth to you to have greater influence over the mind of your prospects? It cost me hundreds of dollars to attend seminars and buy resources to learn these techniques. Not to mention the years of practice. $17.77 is a drop in the ocean compared to what you could make by using these secrets. You're discovering the secrets behind making sales to people who in the past seemed distant, unresponsive and like cold-fish. Plus, because this is material for helping in your business, it's tax deductible! So if you're not happy with what you discover in "Influence and Persuasion" I don't expect ... or want ... to keep your money. But... "Influence and Persuasion" is yours to keep no matter what, as a "thank you" gift from me! This book teaches you how to train yourself to automatically answer objections. Couple this with "Influence and Persuasion" and it’s a very powerful combination. AND just keep in mind how many more sales you'll make in the next year due to Your new found ability to influence and persuade. Then compare how much that will profit you to the small asking price of "Influence and Persuasion". P.S. This information is everything you need to exert more influence and be more persuasive and make more sales.